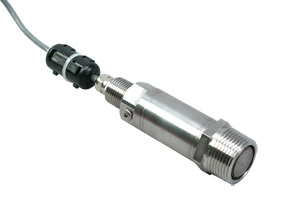 OMEGA’s PXM42 Series is a high accuracy, current output, industrial pressure transmitter with a specially designed flush diaphragm for use with industrial fluids and slurries that are difficult to measure due to sticking or plugging of orifices. Its hermetically sealed, all stainless steel construction makes it suitable for the harshest industrial environments. Three meters of two conductor vented shielded cable is standard with a 1 /2 " NPT conduit fitting on the body for conduit installation. Pressure ranges from 0-400 mbar up to 1.6 bar are available to cover low pressure processing and industrial applications. The PXM42 is also available in standard/Imperial configurations, with 1-11½ NPT port, and ranges from 0-3 to 0-30 psi. Please see the PX42 for complete details, or contact our Pressure department for more information..
注: All models with vented cable ("G7") are supplied with desiccant.